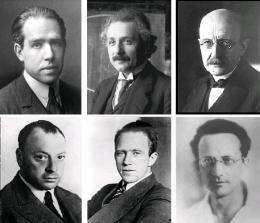 Some of the physicists who made early contributions to quantum mechanics (left to right, top row first): Neils Bohr, Albert Einstein, Max Planck, Wolfgang Pauli, Werner Heisenberg [Credit: Deutsches Bundesarchiv (German Federal Archive), Bild183-R57262], and Erwin Schrödinger. More information: Juan Miguel Marin. “’Mysticism’ in quantum mechanics: the forgotten controversy.” European Journal of Physics. 30 (2009) 807-822. Well, even if you take a 100% naturalistic approach to this question, and simply define "mind" as the functioning of the "Brain," then the mind DOES influence reality. It's as simple as that, without even considering quantum theory, and regardless of the total nature of "mind," my brain inlfuences it's environment in any number of ways, both directly and indirectly. Just as heat tends to flow from a hot reservior to a cold one, the same thing happens in my brain. So even in terms of nothing more than thermodynamics, the "brain" influences the environment, and therefore, reality. To say otherwise is totally ridiculous. Every keystroke I have made here in this message displaced energy, air, heat, nutrients, etc, and even has a tiny gravitational effect due to displacing matter. All of this, of course, caused by the functionality of the "Brain." So if a naturalist defines "mind" as simply what goes on inside the brain, then the "mind" definitely does influence and alter reality, both in classical physics and in quantum theory. Else you would have a fundamental contradiction of basic concepts of physics. In pure naturalism, every part of reality has impacts on every other part of reality, either directly or indirectly. Uhmmmm, seems a chicken-egg thing here. Isn't your mind that is influenced by reality rather than the reverse? How can you say you influence the reality since you are part of that reality. You are also the reality. So, who is influencing who? Is there a who? This ignorant article does complete injustice to the core philosophical question, by strategically using the phrase mysticism over and over. Absolute non-sense. The revolution that was quantum mechanics was primarily a epistemological one and still is. That physicists did not wrap their heads around this straight away is taken advantage of by Marin. Bohr got it right, though did not refer to then existing philosophy of mind,... Einstein either mentioned mysticism in jest or didn't understand Bohr. This is a typical misconception of the issue. The mind does NOT influence reality. The mind effects our CONCEPTION of it. @Quantum_Conundrum - Bravo! Very well said. @magpies - Thank you! I was going to post just that. How can ANY one state that something we do not fully understand does or does not do something? Until you have the facts to back it up, you can not correctly say one way OR the other. My two cents? Personally I do feel that just the act of observing something has some impact on the observed, ranging from quantum uncertainty all the way to Quantum_Conundrum's example of direct physical interaction. You unavoidably influence what you study or percieve, and while our understanding of this process may be limited to our perceptions, I would stake a decent amount of money on a bet saying that we also influence things in ways we are just begining to understand. Although physics has moved on this whole controversy is still very much alive among the public, and even on physorg we have proponents of the mystical interpretation (edit: Ha! already here). One important thing is that when the controversy first developed many of those physicists considered QM to be a fundamental and complete theory but it is nowadays obvious that it is neither. Basing one's understanding of physical reality on a fundamental theory which successfully describes every aspect of it is fine but basing such understanding on a model which is known to be incomplete, inconsistent and full of absurdities is not fine. Especially when the implications of the model are as absurd as is the case with Copenhagen interpretation which among other things requires one to drop causality (of course dropping causality invalidates all the science including Copenhagen interpretation so it's just absurd). The only rational interpretation of QM is the ensemble interpretation also called statistical one which is devoid of any mysticism. SuperHuman, quantum decoherence and many-worlds are interpretations which lie beyond the realm of measurement. Therefore it is a philosophical interpretation,.. it is a faith. Some great physicist have given up on understanding the underlying reality, that is beyond the scope of measurement,.... and some have not, those who wish to interject a faith, ...for example, that the wavefunction is an entity beyond the Born interpretation. All that can be done in science is to relate observables within the bounds of our conceptual framework. "The more you see how strangely Nature behaves, the harder it is to make a model that explains how even the simplest phenomena actually work. So theoretical physics has given up on that. - Richard Feynman, Quantum Mechanics"
"I think it is safe to say that no one understands Quantum Mechanics. - Richard Feynman, Quantum Mechanics"
"One does not, by knowing all the physical laws as we know them today, immediately obtain an understanding of anything much. - Richard Feynman, Quantum Mechanics"
Yeah, I don't quite get the use of mysticism over and over again. I think it's because the author gives the same lazy interpretation of Schopenhauer I always seem to hear: he was heavily influenced by Eastern mysticism. Well, I suppose that's true, to a certain extent. But anyone whose actually read Schopenhauer knows that he was mostly influenced by Kant, agreeing with him up to the point that we cannot know the thing-in-itself (which Schopenhauer thought we could via the human body). Check out the World as Will and Idea...it's good stuff. Ted "Theodore" Logan: "SOEKRATES: the only true wisdom consists in knowing that you know nothing! ...Wow, dude, that's us!" Bill S. Preston, Esq. : "Oh yeah!" It is available but you have to register to read the journal articles. Yes, I agree, I am also aware of all those quotes you cited, they mostly affirm my point that Copenhagen interpretation is no longer considered satisfactory in physics. R.P.Feynman happens to be my favorite physicist due to his intuitive approach, honesty and especially due to his brilliant lectures which I recommend to anyone interested in physics. The primary issue about consciousness is that we are not able to articulate our conscious states in language, nor by any however advanced brain scan. The main issue for QM is that a quantum computer cannot articulate its states using ordinary 0s and 1s, nor by any classical measurement, whatever is scanned. This is a perfect match. It is as beautiful as simple. If we consider consciousness as something real, not illusory, then it has to be quantum, as it is not convertible to just classical messaging. We may live in world too reluctant for this, but some 50 years from now, kids (yeah kids!) sitting home at quantum desk computers and experience the quantum parallelisms and teleportation as the most usual things net to them, will laugh very very loud to hear that long ago there was a time when people though that brain is only a classical computer. Physics has an embarrassing problem. It affects to be a rigorous, hard-headed science, yet quantum mechanics, its most successful theory (it has never made a wrong prediction), seems to rub up inevitably against the problem of consciousness, and even quasi-mystical interpretations of the universe. Why? Because of the extremely odd fact that you can choose to demonstrate either of two contradictory possibilities simply by deciding which experiment to perform. And it is not just "observer-dependent" in a weak sense; by observing a photon, you cause the photon to be there and nowhere else. Before you observed it, it wasn't just in some specific location of which you were ignorant, it was in no particular place at all, or in many places at once. This excellent book provides patient and luminous explanations of the weirdness, and a critique of the normal pragmatic reply: "Whatever works." The physicist-authors agree that it works (lasers, transistors and so on), but argue that the "enigma" of what it means has been swept under the carpet for too long. They end with a series of fascinating speculations as to what it might imply, if taken seriously, for theories of consciousness and cosmology. The physicist Niels Bohr said that if you are not shocked by quantum physics, you don't understand it. Rosenblum and Kuttner have done a brilliant job of shocking the reader anew. and again Feynman rules "The universe is not stranger than we know, its stranger than we CAN know." Einstein of the non mystic realist camp,did say, he got his breakthrough in his own understandings via the twilight world of his dreams.Now, I'm not saying this implies a mystical element to objective observation,however as many have quoted in this subject,we're only at the starting line on understanding both the objective and subjective elements.Importantly we all move forward regardless of our mindsets,and obtain measurement of all science,mindfully or otherwise until we know more of our minds influence or lack of it on reality.First maybe define reality as more than one objective truth or more. Here or stands for observed reality, B is our %u201Ctrue%u201D body, R is %u201Ctrue%u201D reality and the brackets depict some unknown function performed by B. Everything we observe and study, our perceived reality, is in or. B[R] is in metaphysical space, the %u201Cnoumenal%u201D world of Kant (and acknowledged by many others, e.g. Schopenhauer, Quine). It is very important to notice that or is a conscious %u201Cphenomenon%u201D. It is the integrated conscious observation of all humankind. It gives us matter, but also space and time. R, which includes B, and its function , can be literally anything as long as or results from B[R]. Since or is in conscious %u201Cspace%u201D it is tempting to speculate that B[R] is in conscious %u201Cspace%u201D as well. This can be called mystiscism, but, except for the speculation, it is simple logic. You define 'Or' as 'B[R]', which is correct,... but it does not follow that B[R] is a subset of 'Or'. .... while the Range B is limited , the demain is Open, so the entire B[R] cannot be a subset of 'Or'. No idealism. See the article "What if there is only one universe? ", where myself and Hyperion independantly mention Kant's transcedental deduction, in that context. I recommend you go look up Hofstadter's book, "I am a Strange Loop" in the library. It is an interesting read. He makes some good arguments, regardless of if you'll believe them or not. Hofstadter needs to learn how to properly motivate an argument. I admire what he tried to do in writing Goedel, Escher, and Bach. But it was too complicated for such a simple thesis. GEB was a fun read simply because of its complicated-ness. I thought "I am a strange loop" was much more straight forward, but I enjoyed it less. But either way, well designed thought experiments are cool. The primary issue about consciousness is that we are not able to articulate our conscious states in language, nor by any however advanced brain scan. The main issue is that it cannot be defined as it is just a subjective state of human mind. This is non-issue, the main issue of QM is that it is incomplete, inconsistent and leads to absurd conclusions when we attempt to interpret it's mathematical formalism. This is a perfect match. No, they have completely different issues. You assume that if we don't understand A and B then A and B have to be connected somehow which is simply not true. Physics has an embarrassing problem. It affects to be a rigorous, hard-headed science, yet quantum mechanics, its most successful theory (it has never made a wrong prediction), seems to rub up inevitably against the problem of consciousness, and even quasi-mystical interpretations of the universe. Why? Because of the extremely odd fact that you can choose to demonstrate either of two contradictory possibilities simply by deciding which experiment to perform. This is nonsense, QM never made a wrong prediction? Where did you get it from? It sounds like you have completely misunderstood some badly written popular article on the subject. Although in QM you can have superposition of states predictions are probabilistic and can be easily verified. For example if theory says something is a mix of '0' and '1' and both have equal probability while experiments consistently give '1' then the prediction is proven wrong. QM has made countless wrong predictions, if it weren't for renormalization which uses mathematical tricks to overcome it's divergences it would be a complete failure. One of the biggest failures when it comes to predictions of QM is the infinite vacuum energy and therefore cosmological constant which is of course completely wrong. Also you cannot "choose to demonstrate either of two contradictory possibilities simply by deciding which experiment to perform." If it were true the theory would be completely useless. The results are no longer contradictory once you take your measuring apparatus into account. There are plenty of contradictions in QM but mostly in the realm of how and why it works and not it's immediate predictions. It was not my idea to define B[R] as a subset of or. But simply because or is in conscious space I speculate that B[R] is in conscious space as well, just to equate dimensions at both sides. I know I cannot say anything about R, nor about B (except that it must be part of R). The formula tells us something about neurological research on the generation of consciousness. In my opinion that doesnot make any sense, for atoms, molecules, cells, tissues, they all are part of or. And or itself is a conscious phenomenon. If at all consciousness is a generated state, then that generation takes place in B[R], that means in metaphysical space. Thank you for the reference to your book. I understand your point better, thank you, very interesting. Regarding the PhysOrg article, "What if there is only one universe? ", I was not clear above; I did not write the article, only user comments at the end, where we discuss a similar topic. Superhuman: The main issue is that it cannot be defined as it is just a subjective state of human mind. You actually said that subjective state cannot be defined as it is just a subjective state. Did I miss something? It was solved 50 years ago! For a more complete discussion without the references to mysticism that make most physicists suspend objectivity and turn their nose up like a four year old first exposed to broccoli, consider a 2006 publication by the chair of physics at UCSC and a collegue entitled, "The Quantum Enigma." Even Feynmann could not entirely dismiss the issues raised here. He in stead chose to say, "they probably don't matter." Unfortunately, his 'non-denial' comment with only a 'qualified' dismissal has since encountered some real problems. Stick your head in the sand if you will, but don't be surprised when the other end gets mistaken for your head. Narrow minded dogma for no other purpose than athiestic ax grinding has always been a poor substitute for real science, even if you're an athiest. Incidentally, "Quantum Enigma" does not defend, or even propose the existence of diety or the validity of mysticism. They stick to science a lot better than most of the critics of this article have so far done. The distinction between "realists" and "mystics" is only word play. The question is: is c really the upper limit for information transfer? Such a limit, known as the "Einstein barrier " (named after notorious plagiarist A. Einstein) can never be proven experimentally. So, what is the meaning of 'quantum non-locality'? Is there a "hidden" signal with almost "infinite" speed involved? Secondly, mysticism and consciousness are not equivalent. Somehow consciousness is derived from natural laws, and quantum non-locality might be an essential aspect for consciousness. Cosmic non-locality as a natural aspect of 'cosmic' enlightened consciousness is a natural hypothesis, and should not automatically regarded as "unrealistic", since "Einstein's barrier" is only a postulate. The Maxwell/Poincaré/Lorentz upper limit for signal speed (an assumption automatically implied by the very use of the Lorentz coordinate transforms) is the obvious reason why people reject mysticism and religion. Believers of the unproven postulate that c is an upper limit for signal speed call themselves "realists", but this is something they believe in. What existed prior to the constructs of mind? What is true without thought? C as a limit to signal speed requires 3 t dimensional space or other dimensions that are scaled the same as the 3 basic spacial ones. Its humourous that 7 more dimensions and dark matter/energy are regarded as OK premises to explore hypothesis in in physics now (as long as you don't suggest that these have anything going on but dull gravity and not any depth of organisation yet). But not yet in neurology or psychology, where to suggest they exist is heresy. The descriptions of 7 higher dimensions and an active "unseen" universe from "mystic" traditions that are pan-cultural are completely compatible with the physics theories of today. Mysticism is dangerous heresy in most religions though it should be pointed out. And science as a community could be described as one of those churches. The common experience in all cultures by some of experiencing observations of other dimensions, non-locality of information transfer, both spacial, and temporal, and Dark matter/energy complex behaviour is annoying and jealousy inspiring to those who have not shared those observations. Especially when taking photos to show around is not yet possible. But If "mysticism is dead" then it must only be because of a snowball of acceptance that our consciousness has extradimensional and dm/de components and senses, and is a valid tool for observation. lets just say that retrocausuality, separation from external timespace frames of referance, and divergent bubbles of reality may be more common than you think. "The rift between mysticism and the modern sciences derives mainly from elements of scientism in the latter: certain branches of the natural sciences, broadly disavow subjective experience as meaningless, misunderstanding the limitations of the ancient languages. That said, several areas of study in biology (work of Mae Wan Ho and Lynn Margulis are two examples) and philosophy address the same issues that concern the mystic, and modern physicists now struggle to understand a multiple dimensional reality that mystics' have attempted to describe for millennia. Physicist David Bohm speaking of consciousness expressing itself as matter and/or energy would be completely understood by the mystic, whatever his cultural/religious heritage." ""...Spiritual transcendence and religion have little in common. In fact, if we look closely, we can see that these two have been the fundamental antagonists in our history,"
" "As the observing self begins to transcend... deeper or higher dimensions of consciousness come into focus. All of the items on that list are objects that can be directly perceived in that worldspace. Those items are as real in [that] worldspace as rocks are in the sensorimotor worldspace and concepts are in the mental worldspace. If cognition awakens or develops to this level, you simply perceive these new objects as simply as you would perceive rocks in the sensory world or images in the mental world. They are simply given to awareness, they simply present themselves, and you don't have to spend a lot of time trying to figure out if they're real or not." "Of course, if you haven't awakened to [this] cognition, then you will see none of this, just as a rock cannot see mental images. And you will probably have unpleasant things to say about people who do see them"
here a good example of a contemporary "quantum mystic" working on hypothesis of behaviour of darkmatter/energy and higher dimensions from a physics point of view. Not that I think he's got it all right. I doubt his contention that em forces are important. unless they are active in other dimensions from normal matter. We are kind of in a galileo type paradigm change in these times. - In his day everyone thought that not a lot went on in the universe but what was on the surface of the earth. stars, planets, sun all little lights just revolving around us. - Now we have noticed that what we were seeing is only a small fraction of the universe, but we are mostly still clinging to the egotistical notion that not much goes on in that majority of the universe. That wikipedia article on mysticism is interesting, though flawed. Religion and spiritual transcendence have a lot to do with one another. The emergence of the Spanish Mystics after the Reconquista are a great example of the link between religion and spiritualism. Among the more well-known mystics are Saint John of the Cross, Saint Theresa of Avila, and Saint Ignatius Loyola (found of the Jesuits). This conflict between religion and science has gotten completely out of hand. And, to be blunt, the antagonists are largely on the scientific side of the debate, as many scientists mistakenly conclude that evidence of a universe governed by physical laws implies strict physicalism (the material/physical paradigm is the ONLY paradigm). It's faulty reasoning. In the words of John Paull II, "Truth cannot contradict truth." Hyperion huh. :-) the bearer of knowledge. Used the Hyperion alias in forums myself, its a goodie. Nice moon too. Chaotic rotation behaviour, and structurally a honeycomb of hydrothermal vents with reddish gunge at the bottom. In greek legend, one of the minor suns formed from twin balls of uranos. More likely C14 from radiation belt processing of ring nitrogen in uranian system rather than colliding 2 subcritical uranium laced snowballs if it has any truth that hyperion was "helios-hyperion" before his later role as the bearer of knowledge. Ignacious is a good one too. "the un-knowing". Paraphrasing of my alltime favourite theorum/axiom. The infinite hypothesis theorem: Every question answered poses at least one, usually many more questions. Or "the more ya know the more ya know ya don't know." Liguistic defn's can be confusing. In the place of the word mysticism in the above article, it may be that esotericism would be better fitting with the context and intended meaning. The opposite of exotericism (describing the world observed by our senses). On the other hand. If we are scrutinising einstein. I'm reluctant to stress this too harshly, as he seems when being honest about his position to close friends to have been quite firm in his lack of faith in the premises and derivations from them that many since have been required to hold unquestionable. The holy trinity of framedependant similtaneity, Timespace reforming to make any event obey the same motion formulae however distant or high its relative velocity, andt the magic unsurpassable C.
Those do verge on the sort of compulsive insistance to swallow religious doctrine that could fit into many peoples perception of the meaning of "mysticism"
And most religions are the political control structures built on the hypothesis of the structure of behaviours of mysterious phenominon observed by and suggested by "prophets". Often the metaphors they use to discuss these hypothesis get abducted and utilised in the building of a pataphorical universe that gains a life of its own in the troop of initiates that count each other as true believers relativitily. The universe is the archetype of quantum within classical physics, which is the fractal oneness of the universe. Astronomically there are two physics, a classical physics behaviour of and between galactic clusters, and a quantum physics behaviour WITHIN the galactic clusters. The onset of big-bang's inflation, the cataclysmic resolution of the Original Superposition, started gravity, with formation - by dispersion - of galactic clusters that behave as classical Newtonian bodies and continuously reconvert their original pre-inflation masses back to energy, thus fueling the galactic clusters expansion, and with endless quantum-within-classical intertwined evolutions WITHIN the clusters in attempts to delay-resist this reconversion. Here's a question: Is there a continuum of consciousness over all past species here on earth, or is consciousness quantized? If there is a continuum of consciousness, does that imply that those with a lesser consciousness have less control over reality? I like to stop after saying that, "Observables are interconnected with observers/observations." I'm not sure how productive causality (chicken/egg) arguments are.